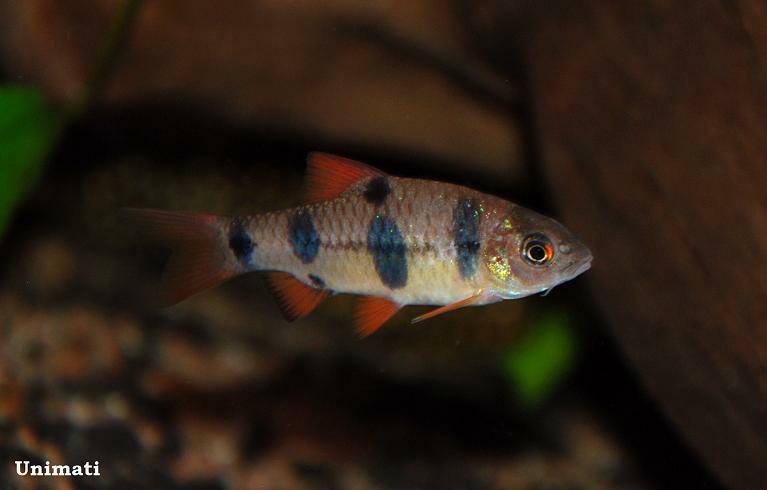 Subadult individual from the aquarium trade. Wild specimen from the Central Catchment Nature Reserve, Singapore. 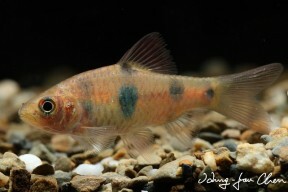 Young specimen from the Danish aquarium trade. 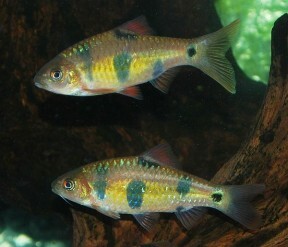 Adult pair from the U.K. aquarium trade, female top. 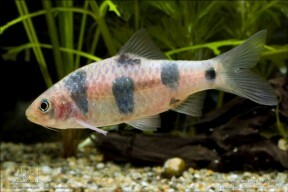 Another individual from the aquarium trade. dunckeri: named for Dr. Georg Duncker (1870-1953), ichthyologist and curator at the Zoological Museum of Hamburg (Zoologischen Museum Hamburg). Described from ‘Bukith Timah, Singapore’ and also occurs throughout Peninsular Malaysia though may now be extirpated in Singapore. Its range in Peninsular Malaysia is also unclear with records scarce, and fish entering the ornamental trade appear to be farm-raised. Unconfirmed but likely to display a preference for forest streams as with related species (see ‘Notes’). This can be further furnished with driftwood roots or branches, and while the majority of aquatic plants will fail to thrive in such surroundings hardy types such as Microsorum, Bolbitis, or Anubias spp. can be grown attached to the décor. Though torrent-like conditions are unnecessary it also does best if there is a high proportion of dissolved oxygen and moderate water movement, and weekly water changes of 30-50% tank volume should be considered routine. A foraging omnivore likely to feed on a variety of worms, insects, crustaceans, plant material, and other organic debris in nature. In the aquarium it’s easily-fed but a balanced diet comprising regular meals of small live and frozen foods such as bloodworm, Daphnia, and Artemia alongside good quality dried flakes and granules will being about optimal condition and colours . This species makes an ideal addition to a peaceful community of riverine fishes such as similarly-sized Puntius, Rasbora, Devario, or Barilius species plus many botiid, nemacheilid and balitorid loaches. As always, thorough research is the best way to avoid problems when selecting compatible fish communities. It’s a schooling species by nature so ideally 6 or more specimens should be purchased. Maintaining it in decent numbers will not only make the fish less skittish but will result in a more effective, natural looking display. When in good condition it should spawn often and in a mature aquarium it’s possible that small numbers of fry may start to appear without intervention. The adult group can still be conditioned together but an aquarium with a base measuring 80 cm x 30 cm should also be set up and filled with mature water. 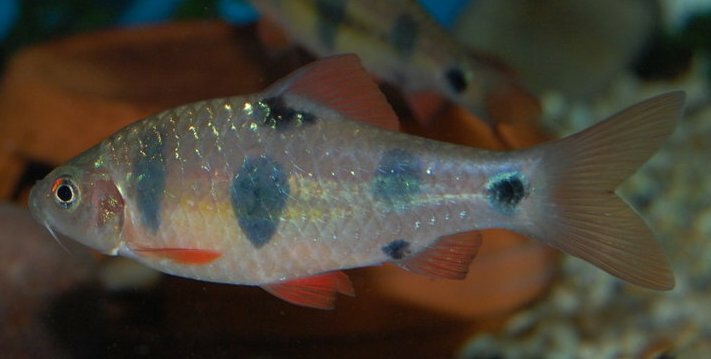 Although sometimes referred to by the vernacular name ‘big spot barb’ this species is better known in the aquarium hobby as ‘clown barb’. 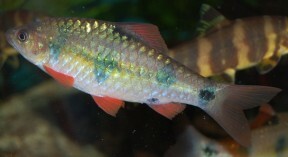 It has been widely misidentified as the congener B. everetti, a distinct and uncommonly-traded species from Borneo and therefore appears under that name in the majority of aquarium literature. The two are quite easy to tell apart, with B. everetti an overall less colourful fish possessing relatively small dark body markings, a distinctive dark blotch at the posterior base of the dorsal-fin, and 3½ scales above the lateral line. 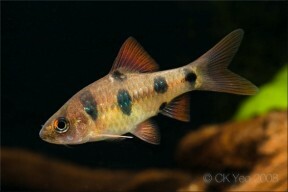 In B. dunckeri the dark body markings are significantly larger, there is no blotch at the posterior of the dorsal-fin base, and there are 4½ scales above the lateral line. Übersicht über die lebend eingeführten asiatischen Arten der Gattung Barbus. For some reason this profile can’t be found neither when searching by its exact title “barbodes dunckeri”, nor when searching “clown barb” or “Puntius dunckeri” or just “dunckeri”. Hi ELOY, a search for ‘Barbodes dunckeri’ works for me. What happens when you search?